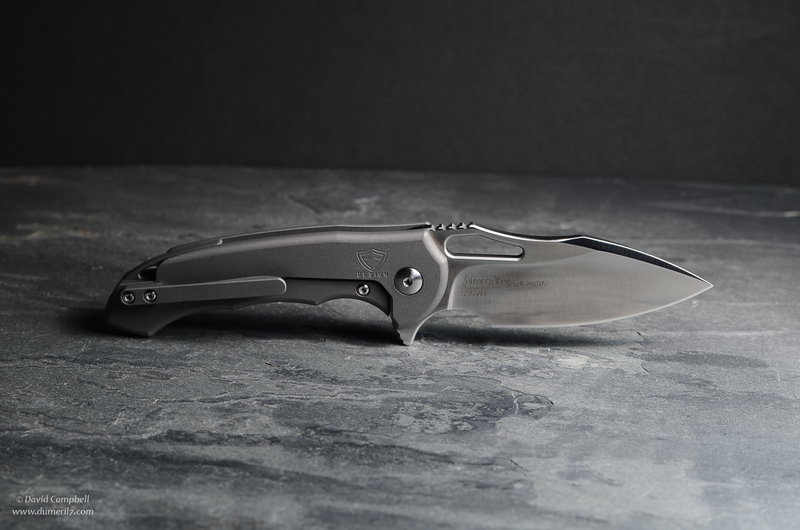 For this post, I'll be reviewing my new knife as well as giving a behind-the-scenes look at the photography I did for the review. So first, the knife. 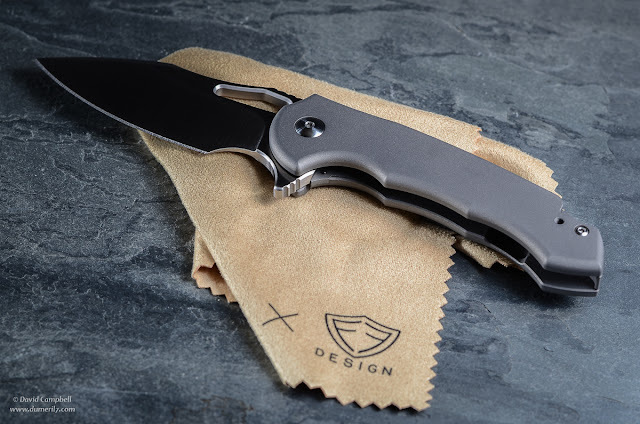 The Massdrop x Ferrum Forge Falcon is a joint effort between Massdrop, Ferrum Forge, and WE Knife. 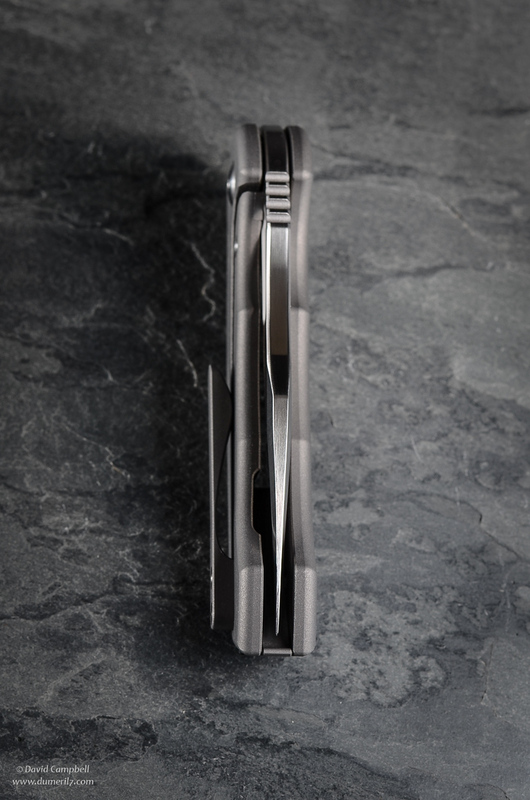 Massdrop is the sole retail outlet for the Falcon. In case you're not familiar with them, Massdrop is an online "group buy" service. (If you're not a member, I highly recommend it. It's free and there are some genuinely good deals to be had.) In a nutshell, they make arrangements with manufacturers to sell selected items at a reduced price if they can get a minimum number of buyers to take part in the deal. If they don't get enough buyers, the deal is off. But if they do, they often get a better price (but not always – you have to do your homework!) than you'd likely find elsewhere online. You only pay if the deal goes through. 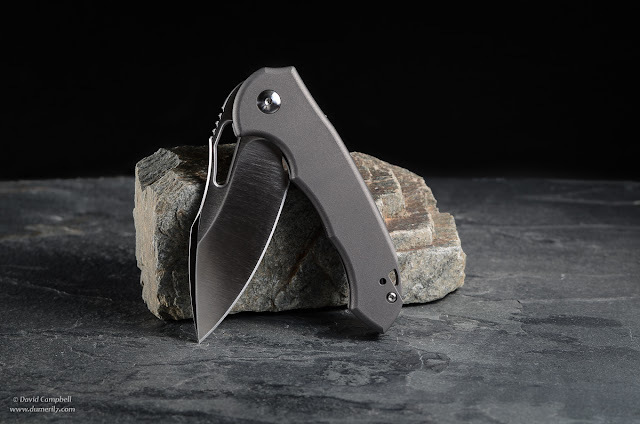 Ferrum Forge is a custom knife maker that usually creates high-end, limited quantity knives that sell for a lot of money. Ferrum Forge designed the Falcon, which is a real treat because before this, you'd have had to pay 3-4 times as much money for their designs. Finally, WE Knife does the actual manufacturing of the Falcon. WE is a Chinese manufacturer of high-end knives. Chinese knives used to be cheap knock-offs of American and European designs, but WE is one of a handful of companies that is changing the reputation of Chinese knives. 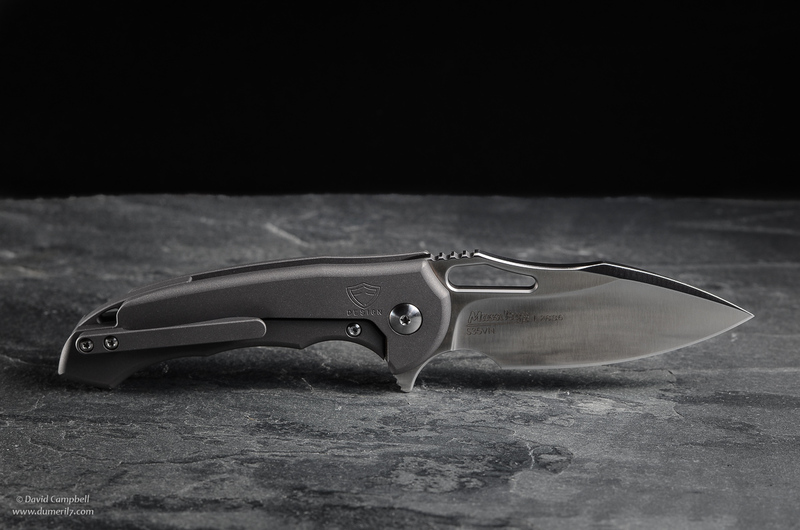 WE's knives are becoming well-known for their quality and design. Now, I should say that I'm not a collector or even an enthusiast, but I do appreciate a well-made knife. And the Falcon is a real diamond. Well, a diamond priced more like a cubic zirconia. First, there's the materials, which are top-shelf and generally only found in knives that cost a lot more. The blade is made from S35VN, which is a truly fine blade steel with excellent edge retention and toughness. The handle is titanium which I think is the ideal folding knife handle material. Its strength, light weight, and ruggedness are just wonderful. If my knife is representative, WE did a outstanding job with the manufacturing. The handle and the blade are nicely finished. Everything fits together tightly with absolutely no play, and the alignment of joined components is all right on the money. When the knife is closed, the blade is perfectly centered in the frame. Parts that are supposed to move do so with a reassuring precision and fluidity. It even comes with a microfiber polishing cloth and a padded storage case. The product and presentation exude quality. As you'd expect from a Ferrum Forge knife, the Falcon has an inspired design. It is minimalist, elegant, and purposeful. It's a fine example of form following function. All clean lines and minimal ornamentation. For such a small knife it feels really good in my big catcher mitt hand. Part of that is the big finger choil at the base of the blade. The choil makes a compact handle fit nicely in a big hand, and in this case the shape and depth of the choil makes it a safer proposition. The downside to the large choil is that there's less cutting edge to the blade. There's also both jimping (nice and chunky) and a generous thumb cutout, on the spine of the blade. You can rest your thumb on either location providing options for greater control or leverage. The handle is compact. I was a little concerned that it might feel insubstantial, but it really doesn't. The choil, the pocket clip, and the depth of the handle provide a better grip and more girth than it might appear from the side. The finish on the handle is a bead-blasted gray. It's a cool looking, all-business finish and it provides enough friction to prevent slipping in the hand, but I can tell it's going to scratch like a mofo. That's just the deal with this kind of finish. 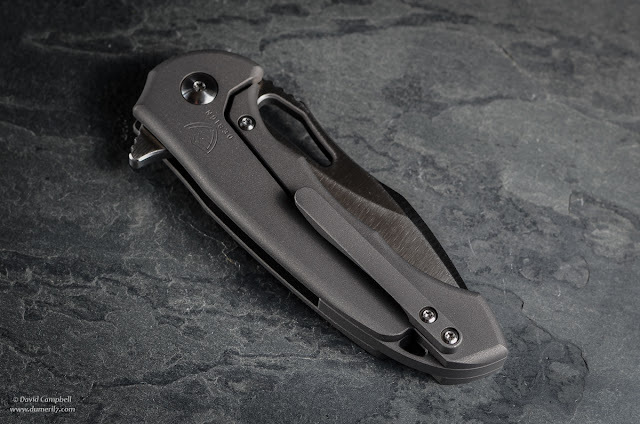 The handle has a titanium pocket clip (which carries tip-up and is reversible for southpaws) and a loop for attaching a lanyard. New and scratch-free. Enjoy it while it lasts. 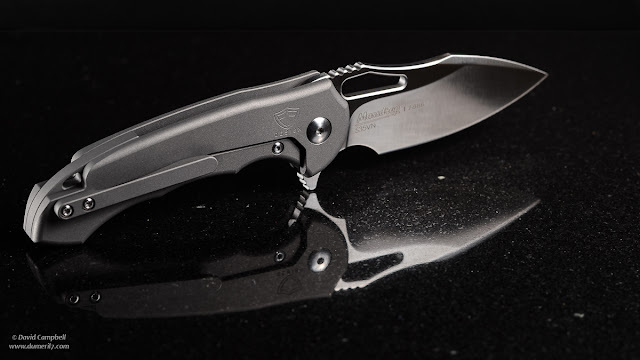 The blade's flipper action is exquisite. Sublime. Candidly, I've not tried that many high-end knives so I don't have a huge sample size for comparison, but for what it's worth the Falcon has the nicest flipper action I've experienced. It flicks out quickly, purposefully, and oh-so-smoothly courtesy of a caged bearing pivoting system and a ceramic detent ball. It locks into place with a satisfying snick. 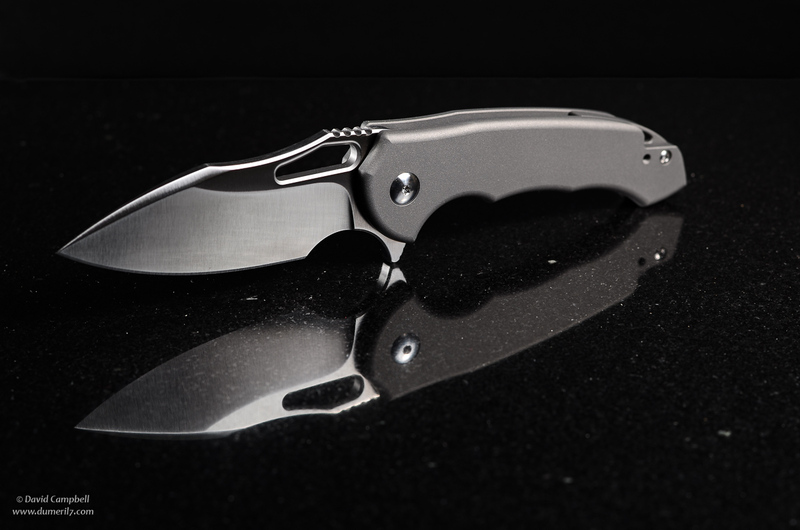 The blade is locked with a frame lock mechanism, which I prefer for strength and simplicity. There's a steel insert on the lockbar that makes the actual contact with the blade. The insert is a thoughtful addition that extends the life of the frame lock. They call him Flipper, Flipper, faster than lightning. This brings me to my one real complaint with the Falcon: I find disengaging the lock a bit fiddly because the lockbar is exactly aligned with the other side of the frame so there's not much purchase area for my thumb to grab onto. The blade itself has a nice shape, with an elegant swedge and contour lines. It's relatively wide for it's length (2.9") and the spine is quite thick, the heft of which contributes to the knife's great balance and flipper action. It's a classic drop-point design, but its so symmetrical you could almost consider it a single-edged spear point. There's really nothing about the blade design that would sacrifice its utility other than the fact that its a fairly short blade. You might expect that the thickness of the blade would compromise its slicing ability, but in practice I haven't had any issues with that. Out of the box, the edge sharpness is quite satisfactory. There is a Massdrop logo etched on the blade along with a production number. I know a lot of people online have complained bitterly about the "billboard" but I think they're making too big of a deal about it. In person, the logo is fairly faint and I don't find it all that objectionable, other than the professional marketer in me (my day job) thinks the typeface is a little cliché. So as you can tell, I really like this knife a lot. I will say though that it is a decidedly compact knife. It wouldn't work for people who need a bigger blade. But for my purposes, small is usually good. I'm an urban dweller. I'm not going to chop wood or field dress a deer with it. 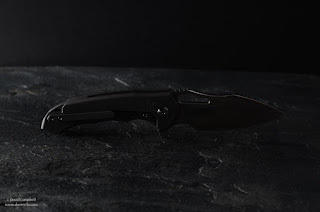 Most of the time, I want a knife that is big enough to use for a variety of "city tasks" but small enough that it's not conspicuous and I can forgot I'm carrying it until I need it. And for that the Falcon is pretty much ideal. [6/30/2018 Update – Well, it's 5 months later and I have run into one legitimate problem with it. As many people have reported, the original design for the pocket clip was flawed. When the clip is used, the design concentrates all the bending force onto a very small area of the clip, instead of spreading it out over the length of the clip. This can cause the clip to deform (i.e. permanently bend), which mine did. 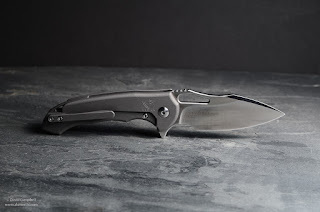 Massdrop/Ferrum Forge redesigned the clip (current versions have the redesigned clip) and offer discounted replacements to buyers who experience issues with the original clip. Honestly, in my opinion they should replace them free. But if I have to pay for it, I'm going to look at my options. And that led me to buy an aftermarket clip ($25) from Pop Custom Clips. Their clip is deep-carry, which I prefer. I got a spiffy looking blue anodized titanium one. And as promised here's the behind-the-scenes information on the photography for this post. For staging, I used one of two 12"x12" tiles to place the knife on – a gray slate tile and a highly polished black marbly-looking ceramic tile. I thought the slate would project the right level of ruggedness to go with a knife. And I wanted to get some cool reflection shots with the polished black tile. The backdrop was a black foam core board, which I stood up behind the tiles. I also had a chunk of gray granite rock that is everywhere around where I live. I thought it might work as a prop, but it only found its way onto one of the final photos. All the lighting was artificial. The key light was shot through my trusty little LumiQuest Softbox III. 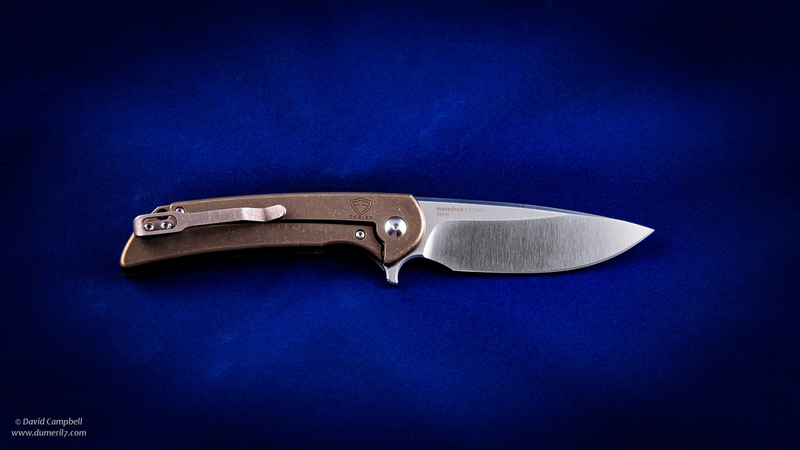 For working with closeups of small objects like a knife, the 8"x9" Softbox III will cast a nice, soft light. You just have to get it really close in to the subject. The key light was camera right, about 8 inches above and to the right of the knife. It actually pointed to a spot in front of the knife in order to feather the light and control reflections off the blade. There was one secondary light. I hung a white poster board on a reflector stand to the side of the knife on camera-left. Between the knife and the poster board I placed another speedlight aimed at the poster board for a bounce light. This light's purpose was a left-side fill light. 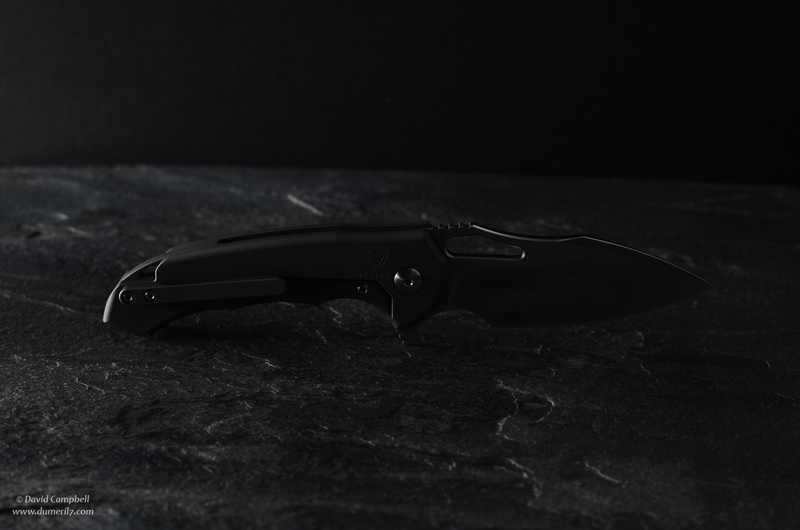 It lightens the shadows from the key light a little and provides some specular highlights on the left side of the knife, which helps it separate visually from the backdrop. For all the photos my camera settings were 1/200 shutter speed, f/8 aperture, and 100 ISO. As for speedlight power levels, I can't recall the exact settings. Honestly, I typically get my lighting power by shooting a test shot, looking at the photo preview and histogram, and then making adjustments to the speedlight power and placement based on what I see. Repeat until I like what I see. I triggered my speedlights using Nikon's CLS system. Flash power was controlled manually (i.e. not TTL) but remotely using CLS. Key and side lights together. Similar to key-only, but notice the highlights on the left end of the knife. It's a subtle thing, but it keeps the left side of the knife from fading into the background. It's more pronounced in other shots. I shot as much on a tripod as I could. Using a tripod, I can really nail the focus by going to Live View mode (to see what the camera sees on the LCD), zooming in as far as I can, and then manually focus the lens. But some shots I went handheld just so I could more easily experiment with angles. For the photo of the levitating knife, you've probably already worked out what I did. I suspended the knife from a boom stand with fishing line, then I removed the fishing line in Lightroom using the clone brush. 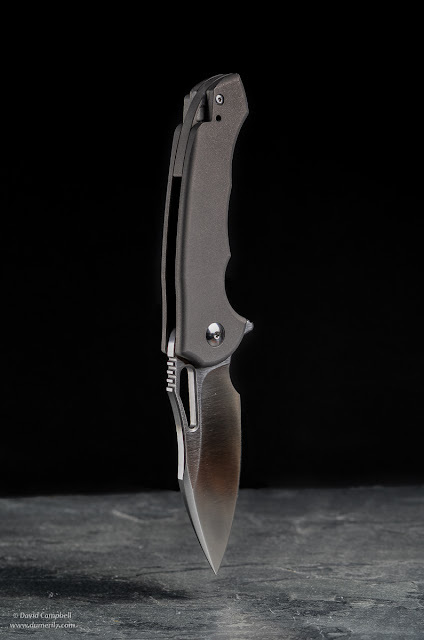 And finally, for the one photo of the Crux, I used a light tent. A light tent is a white translucent box made from the diffusion cloth you'd find on the front of a softbox, with a wire frame to hold the box shape. You can shoot flash or continuous light through any side of the box to cast soft light onto items you place inside to photograph. You can create a seamless background by hanging a cloth or paper panel from the top-back inside edge of the box and draping it down and across the floor of the box like a seamless backdrop. Light tents are a fast and easy way to get soft, even lighting for product photography, but they can also result in very generic, unimaginative images. It's a lot more work, but I think using regular lighting tools – softboxes, reflectors, scrims, and so on – is more flexible and creative. But if you need to quickly put together decent lighting for a small object, you can't beat them. Well, I think that about wraps it up!